Historically, keyword research has often been limited to to keyword selection. This is not to say that keyword selection isn’t important; in fact, identifying a small set of keywords to write a piece of content on, or target for a particular page, is still one of the most important skills an SEO should master. However, the maturation of keyword tools has given us far more uses than this singular skill. Unlike tools of the past, we aren’t limited to the standard process of “keyword in, keywords out.” In this post, I hope to show how a keyword tool like Keyword Explorer can be used to accomplish far more than page-level keyword targeting, bringing keyword research out of the realm of mere keyword selection. 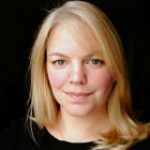 Know thyself: What can my site rank for? The Greek philosopher Plato explained in Phaedrus that it would be silly to investigate things external to him without first knowing the truth about himself. This aphorism is especially true when we consider problems in keyword research where the results returned are only meaningful in the context of our own site. A keyword difficulty score of 60 is meaningless without knowing your current state (perhaps I own Amazon.com and will have no problem ranking for such a term, or perhaps I’m a new site and have no chance). Thus, I believe all keyword research should begin with this simple process of determining your website’s current limits. We’re going to use Keyword Explorer to identify the average keyword difficulty of keywords for which you already rank so you have a benchmark with which to test all future keywords. I know some of you are already thinking — hey, Russ, didn’t you just write an exposé on how this data in Google Search Console is unreliable? Well, yes, I did. So what? Sometimes you have to work with what you’ve got. In this case, Google Search Console actually happens to provide more than sufficient information for us to accomplish our goal. 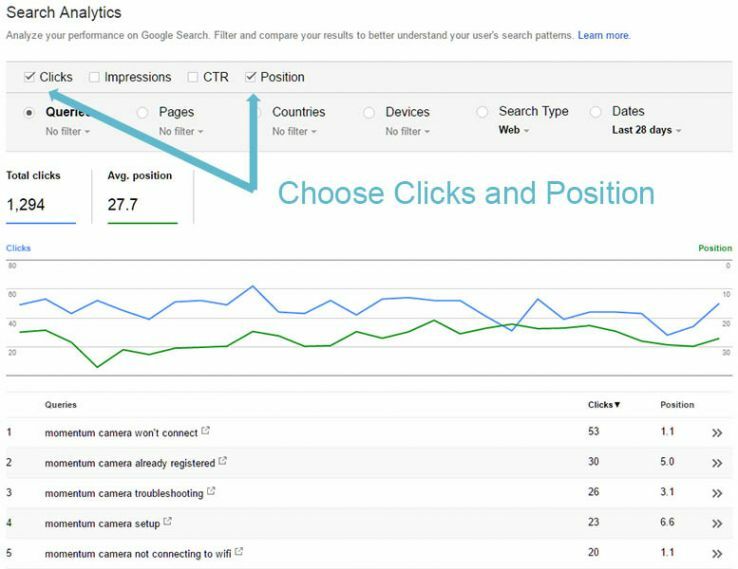 The first step is to order your Queries in Search Console by Clicks and choose to show Position as well. rather than estimated clicks can prevent keywords from showing up in your list for which you have a national presence but are actually rarely seen by users because the term generates a geographically influenced SERP. The goal here is to limit ourselves only to keywords that are in a position to drive traffic. Since our data is already sorted by clicks, our most powerful and valuable keywords are at the top. Pro tip: You might also choose to exclude branded keywords by filtering out your brand in the keyword column. 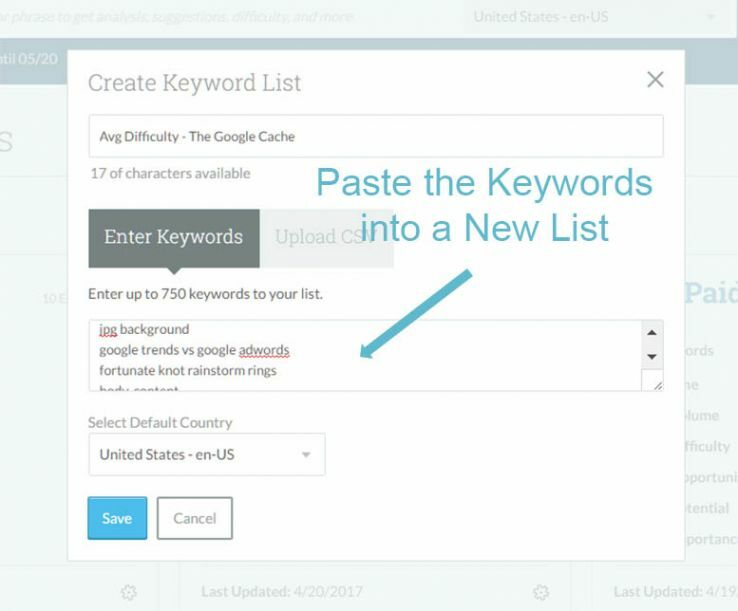 Head over to Moz Keyword Explorer and copy the keywords into a new list. You might want to name the list something like “Keyword Difficulty Average” to remember its purpose. Add your top 750 keywords and hit submit. 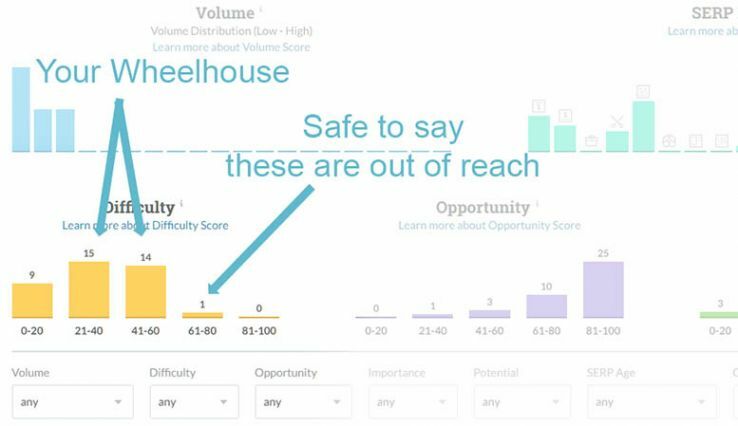 Now that your list is complete and Keyword Explorer has finished building your report, you have great data with which to work. You can look at the summary statistics to get an idea of the average keyword difficulty, but I prefer to use the charts. If you look at my example below, it seems like most of my keywords fall in the 21–40 range, and a handful in the 41–60, but there is a stark drop-off in the 61–80. If I imagine a curved line connecting the bars in the chart, I can see that it probably peaks somewhere around the 35–40 range, which is likely the highest I should regularly target for keywords. Pro Tip: Export the results to Excel and use a histogram via the Data Analysis package to get an even better threshold. Now that I have a strong understanding of what my site can rank for effectively, I can continue my keyword research in earnest. Keyword difficulty scores now have meaning to me that is relevant and useful — I know what I can and can’t rank for. Of course, you can use this metric to help you with your regular keyword research from here on out (I would recommend you update this list with new keywords from GSC quarterly). 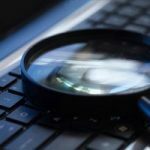 But let’s explore some other interesting uses of Keyword Explorer now that we know our average keyword difficulty. How long-tail should I go? One of the great things about keyword lists in Moz Keyword Explorer is the ability to compare a group of keywords, enabling you to make directory and site-wide decisions that are more far-reaching than standard page-by-page keyword discovery. In this first tutorial, I’m going to walk through a hypothetical situation where a website is trying to decide how far down the long-tail they should go in creating product categories. Imagine for a moment that you have a website that sells apparel — in particular, you sell shirts. You sell both long-sleeve and short-sleeve, and for each of those you sell v-neck, crew-neck, and turtleneck. Finally, you offer 8 colors of each (red, blue, navy, green, orange, white, black, grey). So let’s get started. We will consider those 3 different potential levels of site architecture (shirts, collar types, colors). We’re going to start by using a hugely useful tool: Keyword Mixer. 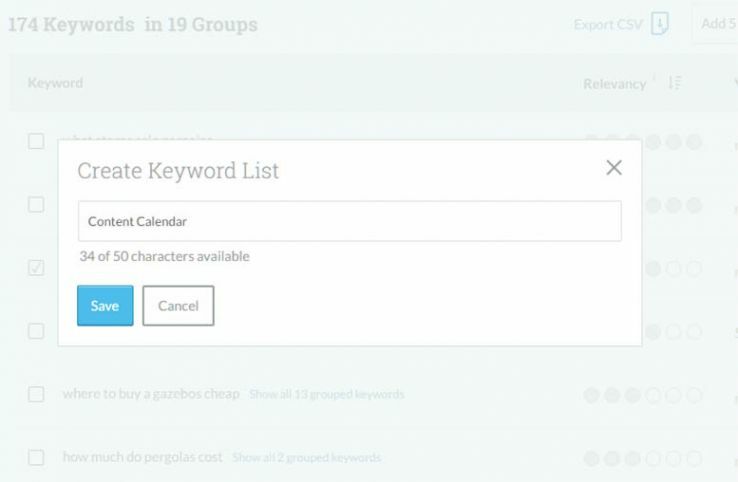 We start by putting each one of those categories into one of the columns in Keyword Mixer. When we hit “combine,” it will create a list of all the keyword combinations of these 3 potential categories. Next, we do the same thing, but we put the colors into the 2nd column along side the collar types. This will give us a list like “long-sleeve shirt red” and “short-sleeve shirt turtleneck”. Copy and paste each of the lists generated by Keyword Mixer into separate keyword lists. As you can see below in this example, I made 3 different lists. Pro tip: Try changing the order of keywords, like putting the properties before the product type. For example, most people would search for Red Long-Sleeve Shirt, not Long-Sleeve Shirt Red. This will require that you create more lists, but you might find an even better potential architecture. In the crude example above, the flatter architecture was the best, where we didn’t use every possible combination of every type of product. Why? It turns out the long-tail keywords get almost no traffic and the keyword difficulty is just as high, if not higher. Of course, if you follow the pro tip above, you might find an even better combination. Using Keyword Mixer in combination with Keyword Explorer gives the the ability to predict which type of content architecture you should create for your eCommerce site. 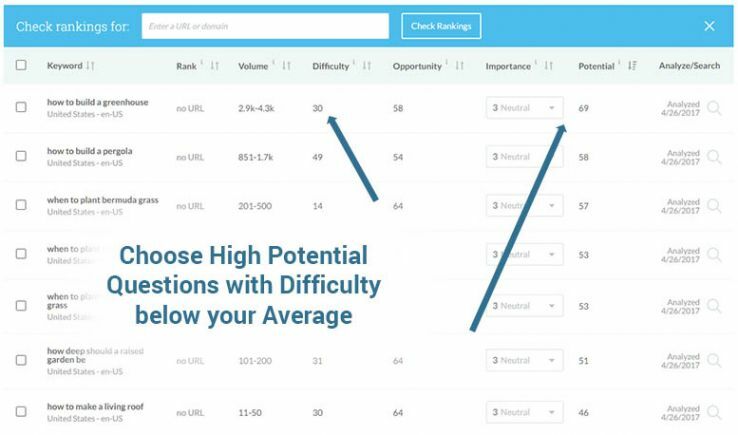 Finally, you can compare this to your average keyword difficulty measurement above to make sure you use a category depth that is achievable. Perhaps the “best” category option is not actually available to your site because it has too high an average keyword difficulty. How should I organize my local pages? One interesting problem presented to me when I was a consultant many years ago was a deceptively simple question: “Which should I use in my local results, zip codes or cities?” The company had an expansive service area and they were trying to decide between having all their local pages organized by zip or by city. At the time, I used an elaborate set of spreadsheets, scraped SERPs, and API calls to try do exactly what takes just minutes in Keyword Explorer. I’ll walk you through the details. We return to our good friend Keyword Mixer here. We start by entering in the cities for which we have coverage and the keywords we would like to target. We then repeat the same process but replace the cities with the zip codes. Follow the normal procedures and copy and paste, waiting for Keyword Explorer to calculate all the important metrics. Finally, we compare the metrics of the two groups of keywords. In this case, while there was similar keyword difficulty, there was slightly more traffic available when using the city rather than the zip code. The best part about this methodology is you can answer the question with good data in a matter of minutes. In this example, I only used a couple of cities and a couple of keywords. This could be expanded out to dozens of cities or zip codes and hundreds of keywords, all to the same effect, in just the same amount of time. This doesn’t exactly take advantage of the list features dramatically, but it does make it easy for you to plan out content several months in advance. The earlier you get writing prompts into the hands of your authors, the more likely they can hit their deadlines. Let’s walk through the steps of building content recommendations with Keyword Explorer. 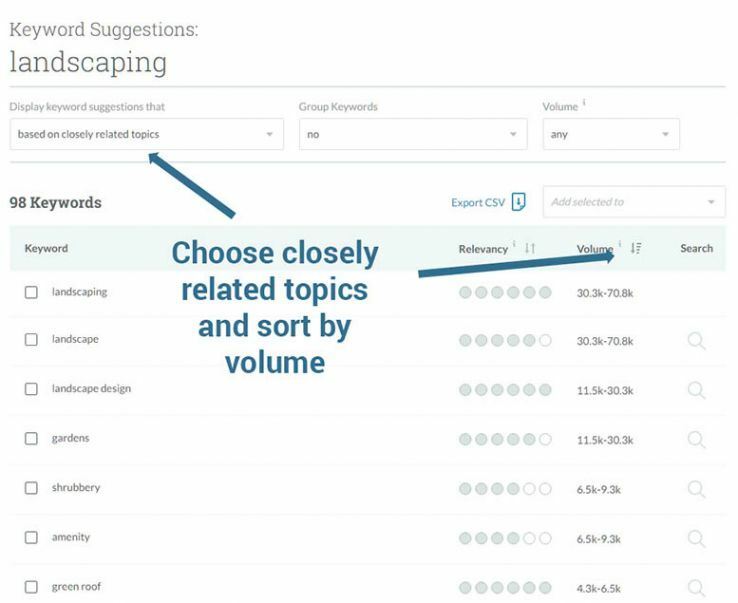 Head on over to Keyword Explorer and drop in your primary keyword like “landscaping” and choose “closely related topics.” Finally, sort by “Volume” rather than relevancy, since you’re looking for generally related topics, not highly related terms. Just run through the list and try to pick out a handful of general topics. In this case, from the word “landscaping” we were able to select “gardens,” “green roof,” “gazebos,” “water conservation,” “pergolas,” “rain garden,” “hardscape,” and “water garden.” Notice that all these great topics showed up in just the top 20 options. We could easily find dozens more just by scrolling down the list. Questions make for easy writing prompts, and questions that actually get traffic are even better! Copy and paste each keyword, one at a time, into Keyword Explorer. From the same filter drop-downs choose “Are Questions” and “Group by Medium Lexical Similarity.” You can fool around with the lexical similarity metric to have tighter or looser groupings. If you use the word “pergola,” as we did in the example below, you will find several questions that are directly related to the topic and, importantly, are representative of several terms. For example, the question “How to Build a Pergola over an Existing Patio” is actually representative of 9 terms, which means writing on this topic will give you a good chance to rank for several terms, rather than just one. This is the easy part. Just click the checkbox next to the questions and add them to your list. You should repeat this step with every topic you discover. In my case, I was able to come up with over 75 article ideas, each representing 3 or more related questions, in under 10 minutes. Always remember your original average keyword difficulty number. This is hugely valuable in scoping out your content calendar because you can easily exclude writing prompts that are too competitive. 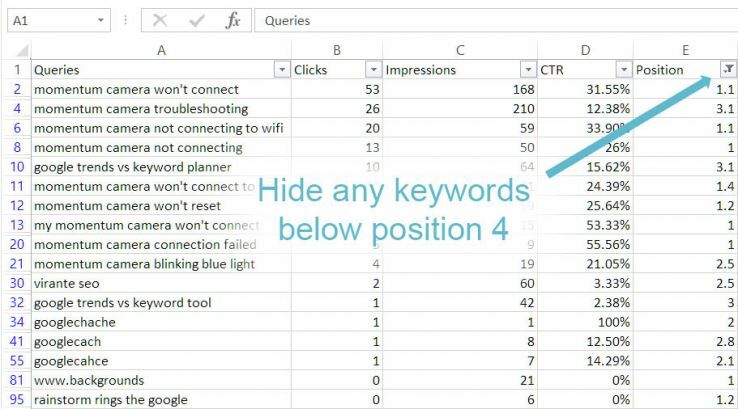 Click into your list in Keyword Explorer and sort by potential, remembering to ignore those with a keyword difficulty higher than your average keyword difficulty. 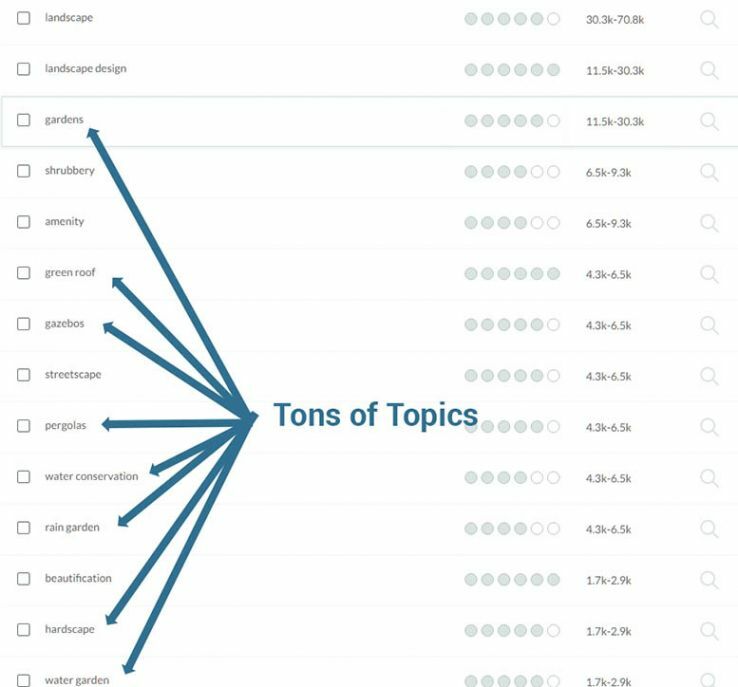 Pro tip: Group your keywords into topic-specific lists, so you can compare the keyword metrics at a topic level as well. Use this list to prioritize out a steady schedule of content creation. Of course, a lot more goes into creating a content calendar than just finding content to write about, but I often find that brainstorming content is one of the more time-consuming projects. Keyword tools aren’t just for page-by-page keyword selection anymore. Smart features like lexical grouping, related topics, and list comparison allow you to accomplish far more than ever before, rather than just staring at a long list of phrase-match keywords. Taking the time to learn the features of these more-powerful-than-ever tools will mean greater efficiency and smarter decisions.